You are here: Home › Blogs › Community › Thank you for participating in International Day Against DRM 2018! Thank you for participating in International Day Against DRM 2018! Thank you everyone for helping to make September 18th another successful International Day Against DRM (IDAD)! Digital Restrictions Management (DRM) is an issue we have to face every day. 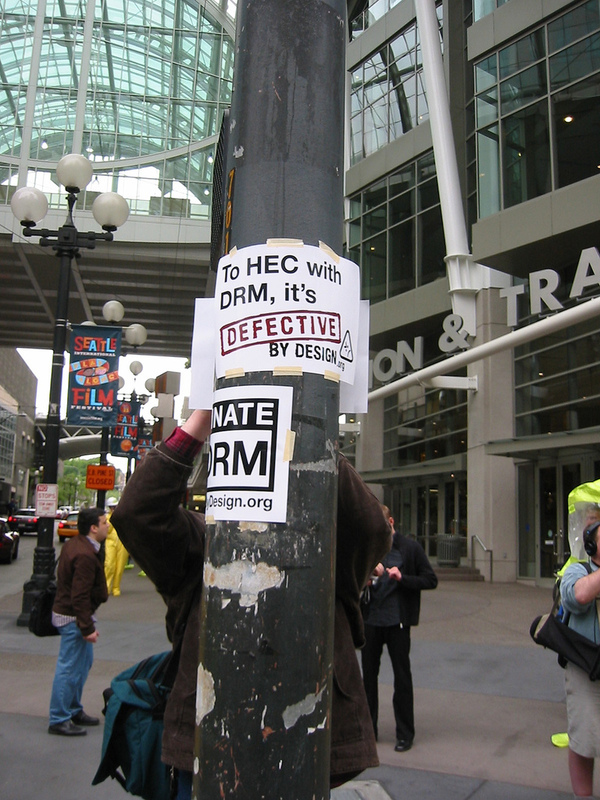 In rallying together for a single day against DRM, we sent a powerful message: DRM is just wrong and we can live in a society without it. Hundreds of you around the world took action on IDAD: going out into your campuses, communities, and around the Web, and sharing your opposition to how DRM restricts your freedom as a user of software and media. The 17 participating organizations took their own actions, creating videos, releasing reports, and writing articles. Here in Boston, we visited the Apple Store and talked with shoppers about their digital rights and how Apple devices abuse those rights using DRM. Even though IDAD 2019 is a year away, you can continue taking action against DRM. You can join the DRM Elimination crew and sign up for the Defective by Design email list on DefectiveByDesign.org. You can follow us on social media or join the discussion on IRC on the channel #DefectiveByDesign. We appreciate everything you did this year, and want to give one last big thank you to everyone who was involved. Photo courtesy of rafial on Flickr. This image is licensed under a CC BY SA 2.0 license.